Are duplicate files on your Mac driving you nuts? Now you can zap 'em! 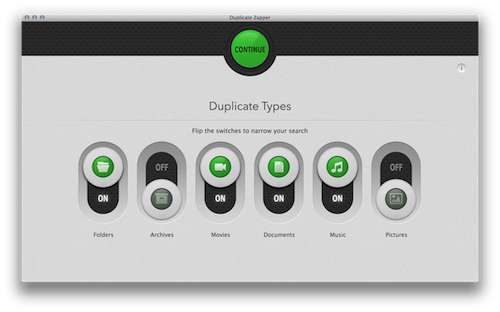 Today we released Duplicate Zapper in the Mac App Store, our newest Mac app designed for the quick, easy and thorough removal of duplicate files. 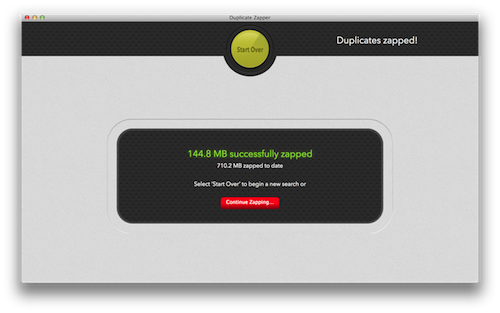 Duplicate Zapper is available exclusively in the Mac App Store at $0.99. Based on the functionality of the Duplicate cycle in our Mac cleaner utility Washing Machine, Duplicate Zapper offers the same powerful, advanced and effective way to find and delete duplicate files that could be cluttering your Mac. Leveraging our long history and experience developing Mac software, Duplicate Zapper has been built around user confidence and trust. 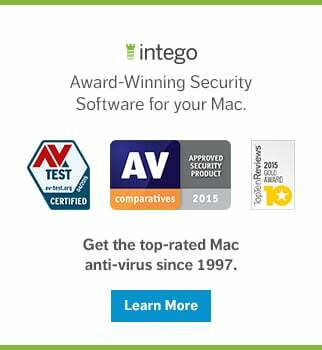 It even contains safeguards to prevent the deletion of system critical files that Mac OS X or applications rely on and it deletes duplicates to the Trash Bin first for easy recovery if necessary. However, with security in mind, you can delete files the way you want: delete to trash, delete completely, or secure delete to ensure the file is never recoverable. Its easy-to-configure searching lets you search local folders and Mac archives, as well as by commonly-used file types like Movies, Documents, Music, and Photos. It is also possible to ignore shared folders, which prevents unnecessary searching and saves time. Once you have selected the duplicate types to scan, click the Continue button to choose scan locations. Here you can customize your search by adding or removing locations you want to scan on your Mac. 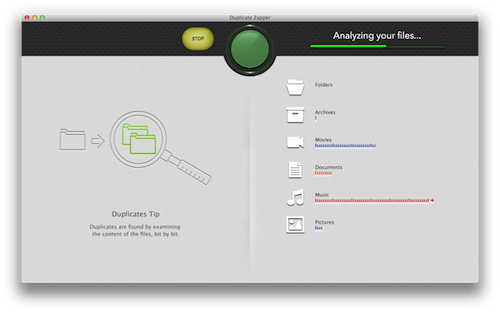 Once you have selected the locations you want to scan, click the Scan button to begin analyzing your files. 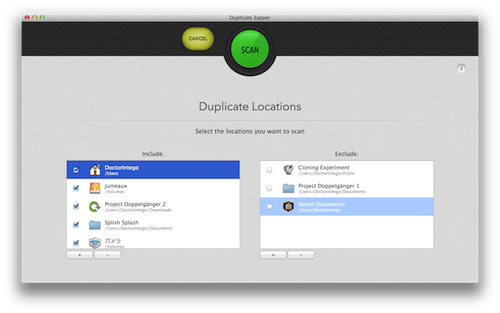 After the scan has finished searching for duplicate files, you can select which files you want to zap from your Mac. Here you can preview file contents without actually opening the file for quick and easy management. Duplicate Zapper offers simple sorting options for the easy organization of duplicate files, and gives you several ways to automatically select duplicates making it easier to zap multiple files. You can save time looking through hundreds of duplicates with Auto Select by path length or by originals. You can sort files by name, extension, size, type and more. After choosing the duplicates you want to delete, click the "Zap" button to remove all selected duplicate files from your Mac. Once your duplicates have been zapped, you'll be given a report that shows how much hard disk space you recovered, including how much disk space you've saved since first using Duplicate Zapper. As you can see, it's very easy to use! 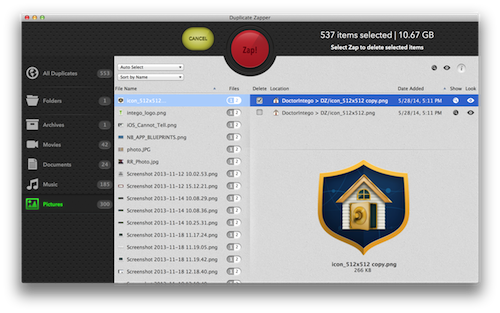 Available for just $0.99, Duplicate Zapper contains everything you need to manage the files on your Mac more efficiently. Give Duplicate Zapper a try and let us know what you think! 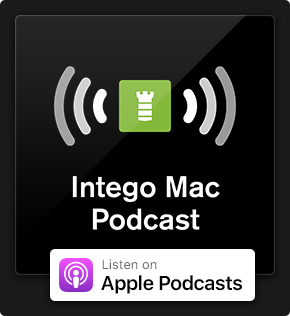 This entry was posted in Intego, Recommended, Software & Apps and tagged Duplicate Files, Duplicate Zapper, Duplicates, Mac, Mac App Store. Bookmark the permalink.